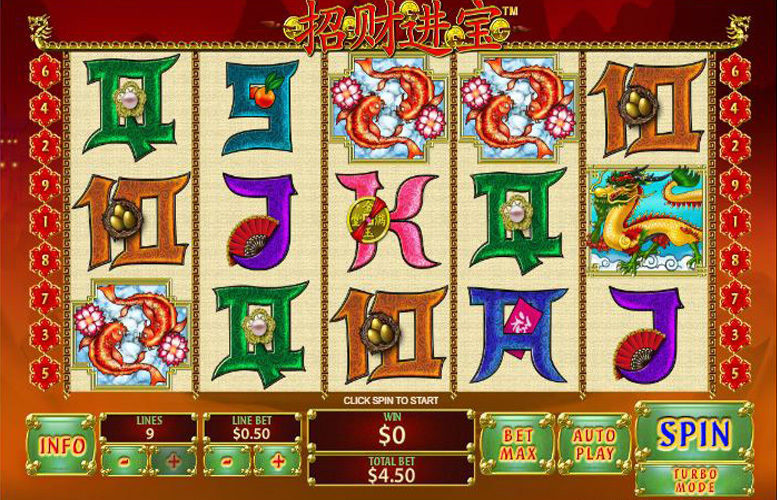 The Zhao Cai Jin Bao slot machine from Playtech has strong visuals and a nice theme. The symbols are typical for an Eastern virtual fruit machine but they’ve been beautifully illustrated which gives it an appropriate feel. That said, the lack of bonus features on the title might put some players off. It’s very much a game that revolves around its larger than average main game wins, and its “wild” double-up feature. Fantastic artwork. The stylised mythological beasts used for symbols look great and fit the theme, and feel of the title well. Top-heavy machine. Even the game’s regular symbols have some decent prizes attached. Large combinations of higher value symbols can be particularly lucrative. Very limited gameplay features. There aren’t any free spins, or additional side games. Even though the prizes are top-heavy, the lack of fun extra bonuses limits the replay value of Zhao Cai Jin Bao. Lion = 5,000x the line bet. Dragon = 2,500x the line bet. Koi, or Phoenix = 1,000x the line bet. The Zhao Cai Jin Bao is limited in its feature department. It does offer “wilds” which double all winnings and multidirectional win lines, so it’s not a total washout. All symbols pay left to right and right to left on Zhao Cai Jin Bao. There is a total of nine pairs of win lines. 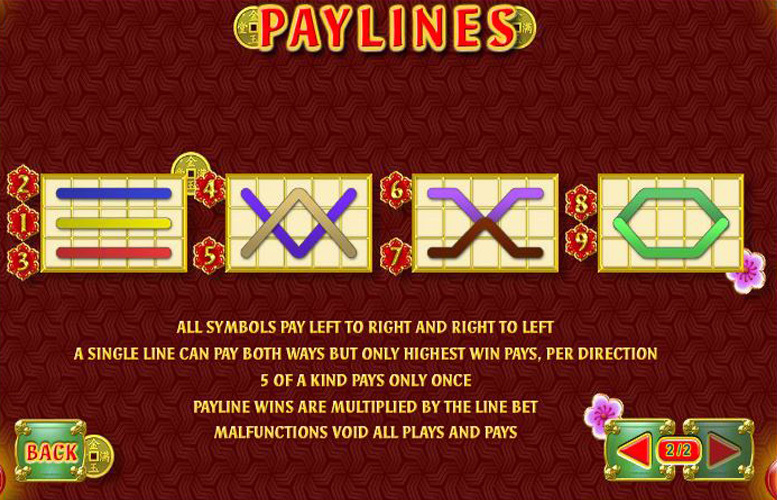 Players should note that five-of-a-kind pays only once, and pay line wins are multiplied by the line bet. The smiling bearded man is the “wild” symbol in the game. It only appears on reels two, three, and four, and substitutes for all symbols. In addition, all wins that use a “wild” symbol as part of their winning combination are doubled. Nice! King = 300x the line bet. Queen, or Jack = 200x the line bet. Ten, or Nine = 100x the line bet. 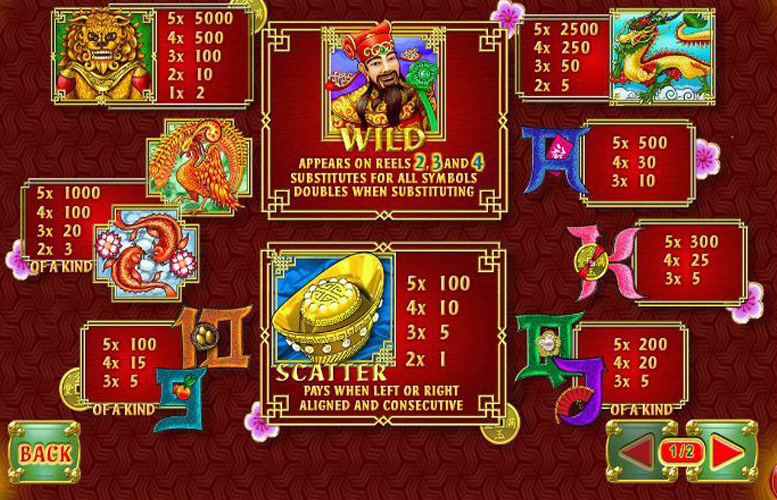 Players can vary the number of win line they play on Zhao Cai Jin Bao. They’re grouped into pairs (each runs left to right, and right to left) so there is a total of nine different ones that can be activate at any one time. Meanwhile, the minimum win line is just one. Players can also adjust the line bet too. Here, the minimum is just 1p, and the maximum is £100. This makes the lowest possible wager per spin 1p, and the highest, a sizeable £900. The Zhao Cai Jin Bao slot machine from Playtech is a title that looks fantastic but struggles to hold its own when played for any length of time. The main drawbacks arise when playing for long periods, and this is because of its limited features. If there was free spin mode, or a different side game it would be a much stronger title. Multidirectional win lines are nice but they hardly compare with some of the fully interactive bonuses featured on many modern slots. That said, it is a top-heavy prize game that allows players to bet up to £2,500 so for those seeking the largest pay-outs and gambles, it could well be a favourite. This game has a rating of 3 / 5 with 367 total reviews by the users.